As the name suggests, Devonport Road is based in the suburbs of Plymouth. The station was the junction of the Southern Railway withered arm into Plymouth and the Great Western branch to Cattewater, the two lines running parallel for a distance to the east of the station until the Southern diverged into Friary and the Great Western continued to Laira Junction. By the early 1990's the GW branch is now a freight only line serving a number of industries in the Cattewater area, these include fuel oils, bitumen, industrial gases, chemicals, coal and scrap metals. The GW platforms have now been converted into a parcels station for handling sorted and high security mail and parcels. The short loops you see on the layout (based on those at Pylle Hill in Bristol) are used to quickly marshal parcel vans after loading and unloading for tripping around to North Road station. 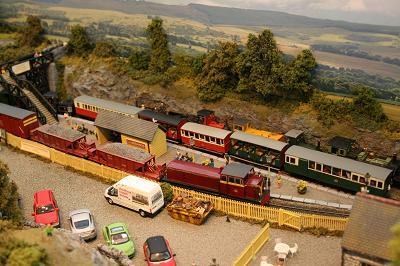 The sidings to the front of the layout are for the civil engineers and feature all manner of engineering and departmental wagons. The SR lines are now cut back to Gunnislake, but trains to the MOD armaments depot at Ernesettle pass through the station, as do china clay trains to the plant just south of Bere Ferrers. A strong preservation movement has also set up at the junction station of Bere Alston. Trains of preserved stock are sometimes seen passing Devonport Road. Plymouth is famous for its naval dockyards at Devonport, home to many of the Royal Navy's surface and sub-surface vessels. The "secret" trains to support the submarine fleet are regularly seen at Devonport Road, along with other general stores traffic. 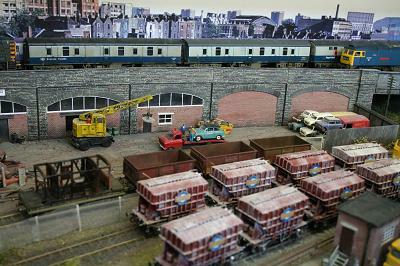 The dockyards have however branched out and also use their facilities to repair, repaint and modify a number of railway vehicles including coaches and HST power cars. These vehicles add to the mix of traffic passing through. 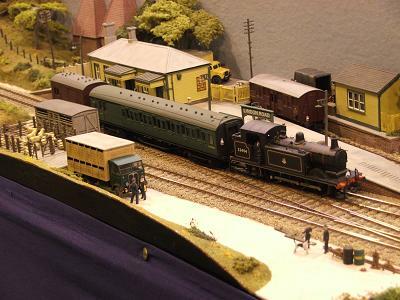 Dudbrook is a fictitious 00 Gauge GWR layout based in the late 1920s and early 1930s on a double track terminus and is my first exhibition layout at the age of 15. The layout is made from PECO Code 100 track with PECO point motors mounted under the board that are controlled by a simple switch panel. I am controlling the layout with my Bachmann Dynamis via DCC. 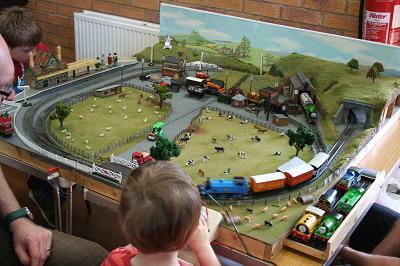 Dudbrook is 9 feet long and consists of a small engine shed with goods sidings while the station is reasonably large with 4 platforms and a run round loop. 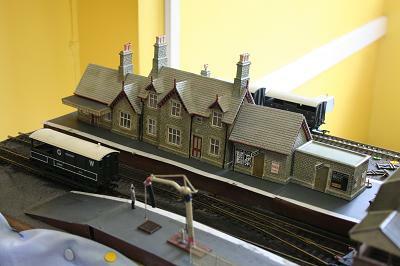 It has been modelled as a more general GWR station with a variety of locomotives and stock movements which are mainly Bachmann or Hornby - most match the era but with a few exceptions. 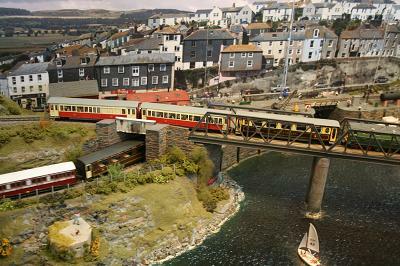 A small GWR terminus in Cornwall on an imaginary branch from Helston to Goonhilly. Track is by Peco. 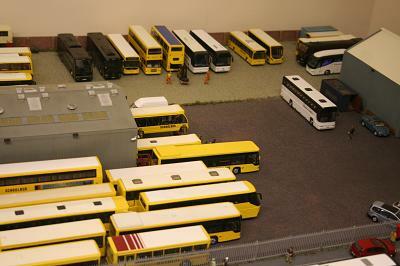 The buildings are scratch built or from modified kits. Operation is by a cassette hidden behind the wall next to the locomotive shed. When the GWR extended its Leominster to Kington branch further on to New Radnor, the new railway ran for a distance parallel to the old horse drawn tramway to Hergest Ridge. The tramway was upgraded to a steam powered narrow gauge line initially using a variety of locomotives but subsequently was able to make use of the ex-Glyn Valley Tramway locomotives which were purchased from the official receiver in 1935 and re-gauged to 2 feet 3 inch. The GWR were persuaded to construct a small station at Hergest to allow a secondary interchange between the standard and narrow gauges. 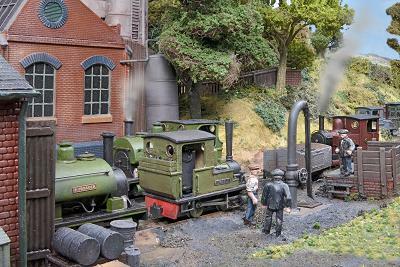 As well as servicing facilities at Hergest, the narrow gauge railway provided the local community with a means of transporting incoming coal and outgoing stone and local foodstuffs. 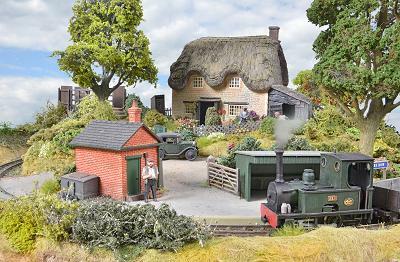 The layout is set in Autumn of 1947, a surfeit of ex-army road vehicles and the return to civilian life of men seeking work would lead to the closure of both the narrow gauge and standard gauge railways within five years. 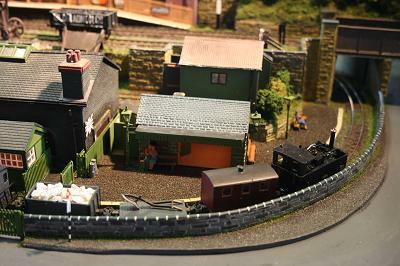 Set in the British Railways period, this small layout represents a fictional Southern Region branch line through station located in the River Medway area. The branch leaves the main Paddock Wood to Maidstone line near Yalding and runs close to the villages of Coxheath and Hunton to terminate at Chainhurst. The line is in its final few years of operation the passenger service is being run down and short trains are the norm, one coach sufficing for the remaining traffic, with the occasional two-coach pull-push set. Freight services are still quite busy with coal and grain terminals at Chainhurst bringing a lot of traffic to the line; sufficient to ensure its survival until the late 1960s. 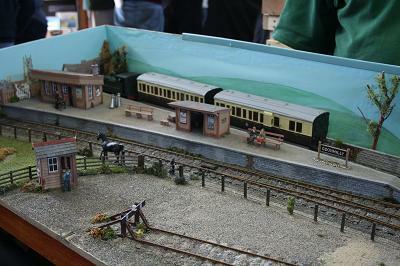 The layout itself consists of three conventional chipboard and timber baseboards with self-contained turntable fiddle yards at each end. The track is SMP Scaleway, with the points being made from the same company's copperclad kits. Pointwork is operated by the old H & M solenoid motors, with the few signals being worked in the same way. 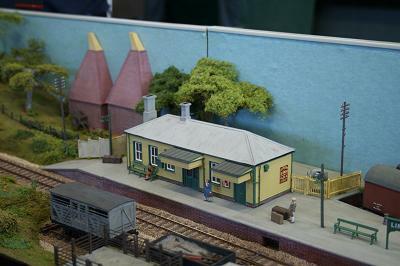 The station building is based on East Farleigh on the Paddock Wood to Maidstone line (still standing at the time of writing) with the other railway buildings on the layout being made from modified commercial kits. 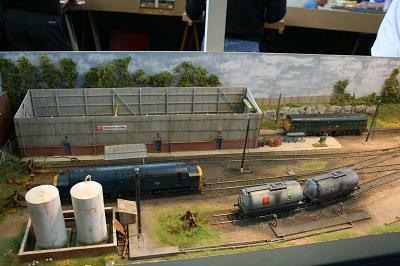 The low relief structures at the back of the layout are scratch built from Wills building sheets. The scenery is based on polystyrene foam, carved to shape and covered with plaster bandage, painted and then overlaid with Woodland scenic ground cover. Motive power consists of small tank engines and diesels, mostly kit built, of Southern and BR Standard origin, with passenger and goods stock from most of the kit manufacturers. 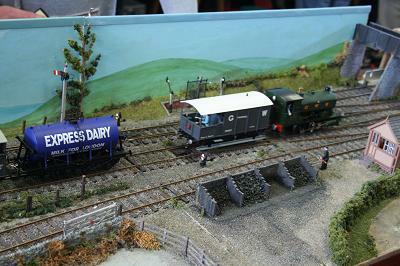 Orchard Road TMD is a DCC operated British Rail depot layout, based in the BR (Southern) region between 1975 and 1983 and features locomotives seen in Devon during these years. 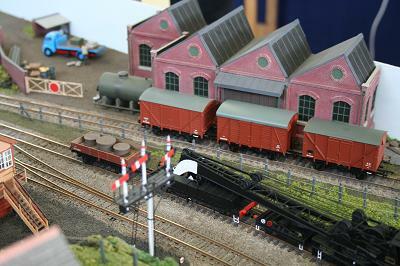 A depot has been modelled in a relatively small space, but includes a maintenance building, locomotive refuelling and fuel off-loading siding with storage tanks. The odd siding has been provided through the bridge, forming the scenic break, this represents the end of a track from the station beyond the bridge. All track is Peco 00 gauge, ballasted and then weathered to represent the track that would be seen at a diesel depot. The major structures are scratch built, but some buildings are kits. The majority of the details are kits, plastic, whitemetal and etched-brass, all have been painted and weathered. Operation is DCC, using a NCE Powercab controller, with the points also being DCC operated via an accessory decoder. The locomotives are a mixture of Bachmann, Hornby and Lima and represent those classes that would have been seen in Devon. All have been weathered and one or two are sound fitted (this will be added to over a period of time). 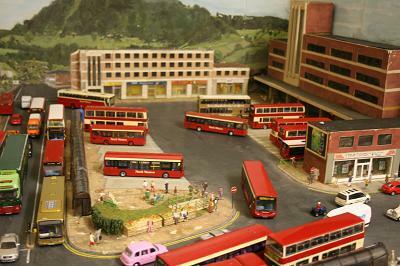 Construction of the layout can be followed on the RMWeb layout thread web site www.rmweb.co.uk – layout thread, search for 'Orchard Road TMD'. 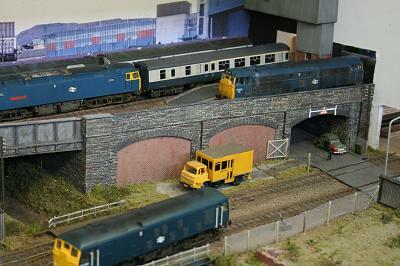 This a vast website covering all aspects of modelling and well worth a look at. Set in 1977, the inspiration for Peafore Yard came from pictures of the Avon Street yard in Bristol which was nestled in the shadow of Bristol Temple Meads station. Located at the end of a branch from the mainline at Lawrence Hill yard, the line was operated by class 03 shunters in later years, the key traffic being Cement in Presflo wagons, Molasses in former class B tankers and scrap trains although the latter traffic had ceased by 1977. 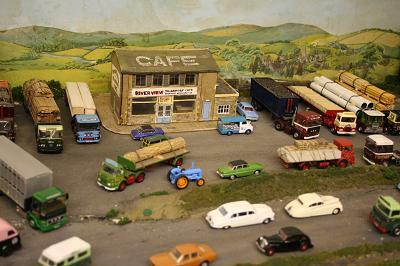 Seeing a picture of 03382 passing the level crossing with traffic being held by Men with flags was crying out to be modelled and although the layout is far from a factual reproduction of Avon Street a number of structures, vehicles and cameos have been reproduced. The year was chosen as the late 70's still had many operating practices from the steam era combined with a wide variety of diesel loco classes still in traffic. The City of Redwood is a fictional town located in the forests of Northern California. Today it has a population of 651 souls; it was established in 1855 by the rough tough lumber men of North America’s frontier land. Today it still relies heavily on the exploitation of the ancient forests for most of the employment and income. However in recent years the increasingly wealthy and mobile population of the San Francisco conurbation has been travelling. Mostly by train they come to Redwood for recreation purposes, enjoying the massive trees and fresh woodland air. The year is 1940, just before Pearl Harbor and effectively the point at which the United States gets involved in the Second World War. Much of Northern California and Southern Oregon is still untouched, covered with virgin forest some of which have the Sequoia Sempervirens growing widely. 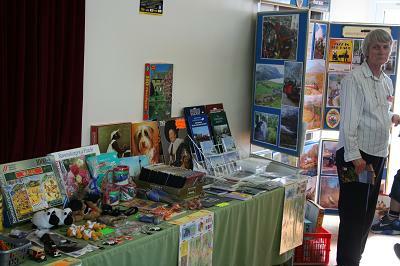 With improving transport links and a booming economy; it is the beginning of the tourist industry. Many people want to travel and the railroads of the region are only too happy to supplement their income from freight by offering passenger services. 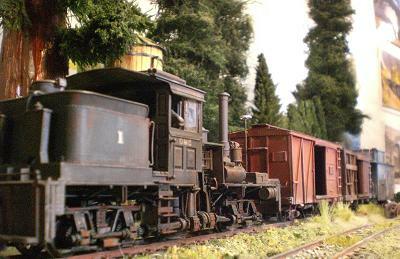 The Redwood Railroad is primarily a lumber carrier from the area surrounding the town of Redwood. To the east trains run through Whiskey Springs and Northspur down to interchange with the Southern Pacific at Willits, a distance of 21 miles. To the west the railroad runs 2 miles down to the Baja Humbug harbour, where unprocessed wood is shipped by sea. Redwood passenger trains are timed at Willits to meet the hourly service that runs from Oakland up to Eureka: at weekend and holidays often extra trains are laid on. Coal, livestock and mixed goods are also being shipped in increasing amounts, trains are run as required to fit around the movements of the passenger services. Due to the mountainous terrain and steep gradients the chief engineer on the line, Abe Simpson, had no choice but to use narrow gauge tracks. It took 4 years for him and his team of Chinese navies to forge the permanent way through the forests. 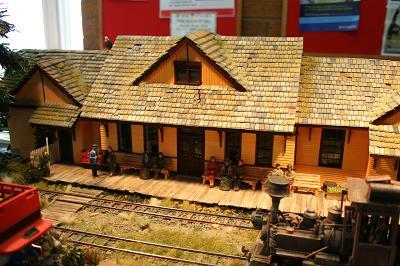 The depot building is scratch built as are the trees that surround it. 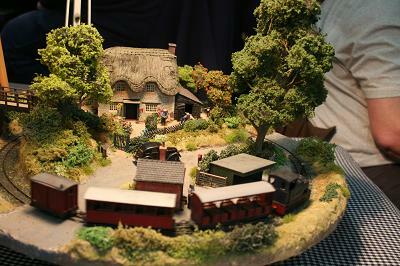 Vehicles are Corgi, rolling stock is mostly modified Bachmann with a few scratch built engines running on HO chassis. Track and points are Peco standard On30, scenic material is mostly made by Woodland with stone and ballast supplied by Merehead products. To all railway fans, enjoy the trees and trains but please be careful not to let our steam locomotives spook your horses and respect this wilderness environment we have spent so long creating. 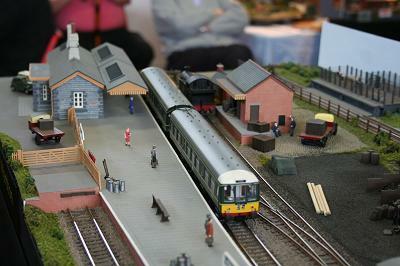 The layout represents a fictional preserved tourist railway situated somewhere on the coast of north-west Wales. Richard has imagined that the original line was built to carry slate from quarries in the mountains to the port of Aberclydach. After commercial operation ceased, the Clydach Railway Preservation Society took over the ownership of the railway in 1954 and re-opened it. The line later expanded onto the track-bed and bridges of a standard gauge branch line which had closed in the 1960's. The new section was opened in 1979 and since then passenger numbers have grown, new stock has been built and now the Clydach Railway (Rheilffordd Clydach) is undoubtedly one of the “Great Little Trains of Wales”. 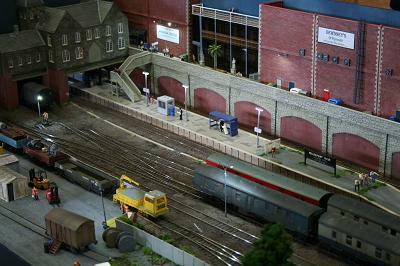 The layout was featured in RAILWAY MODELLER magazine in November 2010, and also in the May and June 2012 issues. 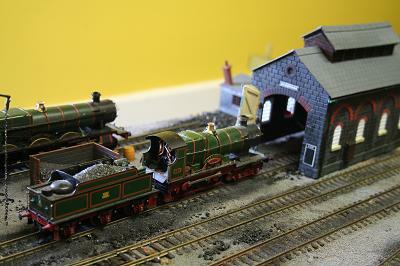 Tansey Bank was featured in the October 2013 edition of Hornby Magazine. 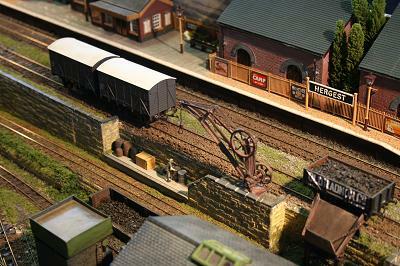 Wardton is a fictional terminus station located somewhere on the Western Region. Originally part of the GWR, as indicated by the building decor, it now is part of BR operations. In addition to the two platform station there is a goods yard and shed for the town and a separate siding for the local factory, which manufactures a wide range of products allowing rail deliveries to be as varied as we like. Track and points are Peco, control is traditional 12 volt. 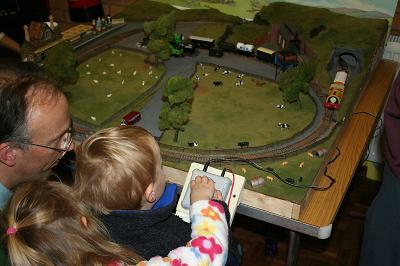 The signals are built from MSE kits components and are operated by Servo motors controlled by Heathcote boards. The signals are not interlocked so correct use is down to the attention of the operator (you may see a few errors especially when Dave is operating). Buildings are mostly plastic or card kits with extra detailing, the goods shed is scratch built due to the limited space in which to fit it. 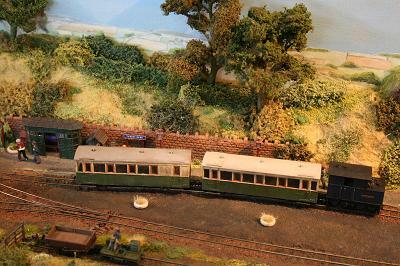 Locomotives and coaches are mainly ready to run; wagons are a combination of ready to run and kits.